Increasingly, today’s caregivers in the healthcare industry are faced with ergonomic challenges due to increasing demand in patient care. This excess of patients is forecasted to steadily increase over the next several years. However, the number of human resources in the healthcare industry isn’t increasing at the same rate. Therefore, we can expect there to be a larger strain on these professionals as time goes by. Due to this shortage of healthcare professionals, medical device companies will need to provide more ergonomically friendly products in order to increase efficiency reduce fatigue and compensate for a potential shortage of human resources. There are a variety of elements to consider in the design of a medical device to increase ergonomic friendliness. Let’s focus on cart design and mobility. Most medical carts weigh about 100 lbs. unloaded and that can increase substantially when equipment is added . Trying to move this heavy medical equipment on a long shift of 10 to 12 hour days  can become increasingly difficult and may create injuries over time. Medical equipment that is designed with casters with low push/pull and swivelling forces can greatly reduce the risk of injury due to overexertion and fatigue. The Canadian Centre for Occupational Health and Safety (CCOHS) requires that the push/pull forces cannot exceed 50 lbs. , which can be difficult to achieve if the correct caster is not used. Choosing the best caster for the specific load capacity can help reduce the push/pull forces to below that 50 lbs. mark. This is also greatly influenced by the floor type and the environmental conditions the casters are being used in. A key consideration when choosing casters for medical equipment is the amount of noise that casters produce when they are being rolled. CCOHS also states that noise levels cannot exceed 90 dB over 8 hours continuously, which can happen if the wheels being used are too hard and going over obstacles or a floor that is not highly polished. Casters specifically designed for the medical industry use softer materials, which provides a reliable solution to this potential problem. Another element to think about when choosing casters for medical equipment is the effects of shock and impact loading. It is important that the caster has shock dampening characteristics to minimize the effects of the shock and vibration on sensitive electronics etc. Typically, a softer wheel tread will absorb energy when the cart goes over some bumps such as gaps between the elevator and floor, cords, and other thick cables. Designing a caster that gently goes over these obstacles will protect expensive medical equipment from shaking too violently as they’re being rolled. Another key improvement to a mobile medical workstation or cart is to use height adjustable handles. This allows the user to push the cart at a comfortable height, which minimizes the risk of overexertion injury and other musculoskeletal disorders. By the year 2020, it’s expected that there will be an estimated 800,000 nursing positions available to accommodate the growing patient intake . However, if positions are not filled within that time, the healthcare human resources sector will experience a significant strain with less people to perform the growing number of daily tasks. 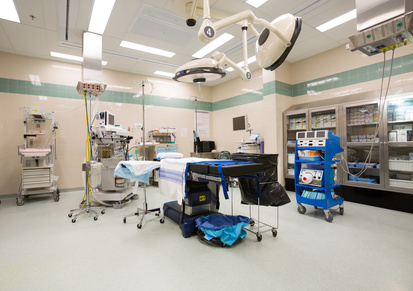 At Darcor, it’s our job to help medical equipment designers improve that equipment design to help to eliminate as much excess stress and strain that mobile medical devices may impose on healthcare workers. To find out more about medical equipment design best practices, take a look at medical casters. To find ways to improve workplace ergonomics, download the Workplace Ergonomics Guide now. Rigid Caster with Option. wheel tread. Sign up for free updates about workplace ergonomics, caster technology, industry news & events, product updates and more. Applied Ergonomics Conference AEC 2019 Just Around the Corner - Get Ready with this Must-See List!